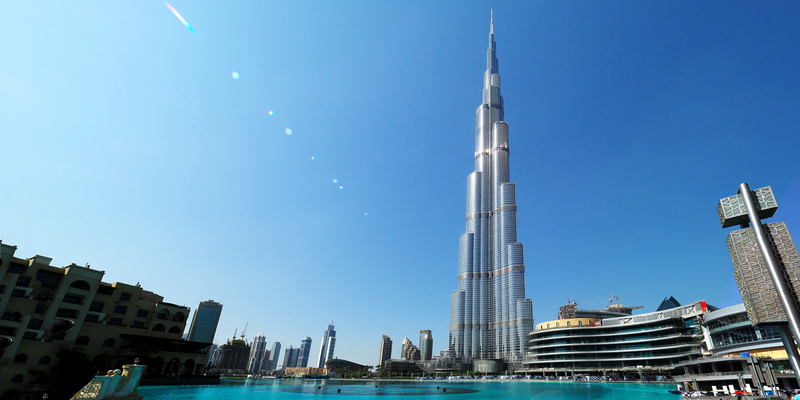 If you love Fairmont Hotels, you’ll feel right at home at the 5-star Fairmont Dubai! Fairmont Hotels : Amazing locations. Signature properties. Excellent amenities. Exceptional staff. 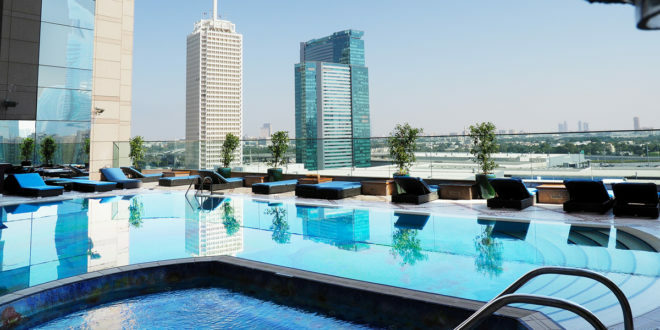 Highlights at the Fairmont Dubai Hotel include two beautiful roof-top pools, award-winning The Exchange Grill, and a great location for shopping! 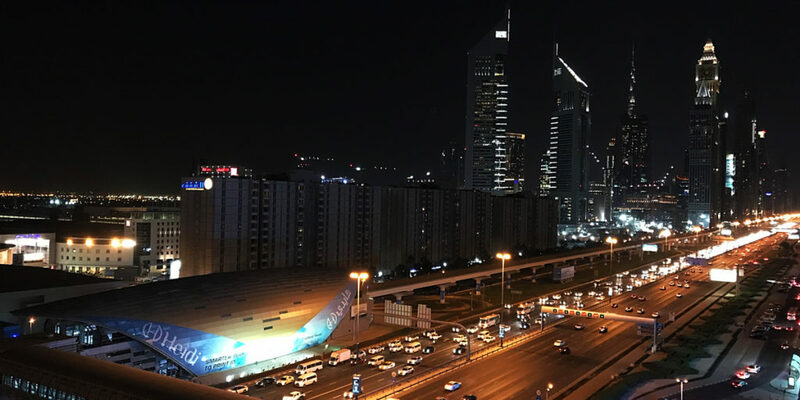 World Trade Center on Sheikh Zayed Road from the 9th floor Dokuz Lounge at the Fairmont Dubai. The location is fantastic for both business and pleasure, centrally located in the financial district across the street from the Dubai World Trade Center and conveniently next to a Metro stop, one can easily and safely set off to explore Dubai, the Burj Khalifa and Dubai Mall. 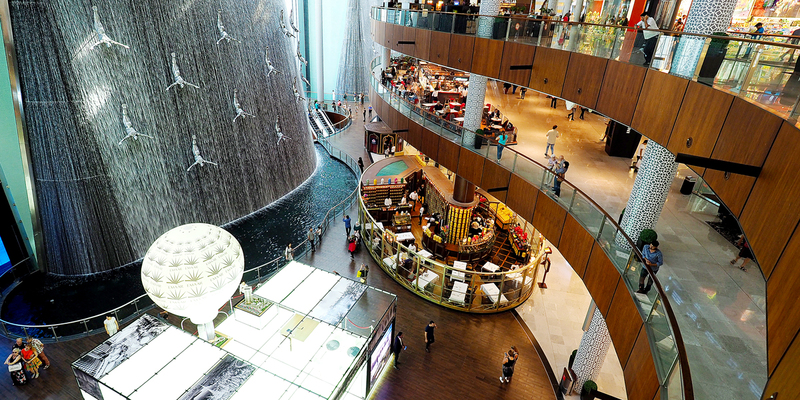 TIP: Fairmont Dubai offers free daily shuttle service to Dubai International Financial Centre, The Dubai Mall and the beach. Ride the hotel shuttle, and avoid the heat. I stayed in a one-bedroom suites with separate sitting room. The suite was immaculate, well equipped, plenty of storage space. Loved the personal touches, rose petals and a welcome treat making the trip memorable and so welcoming. Welcome! 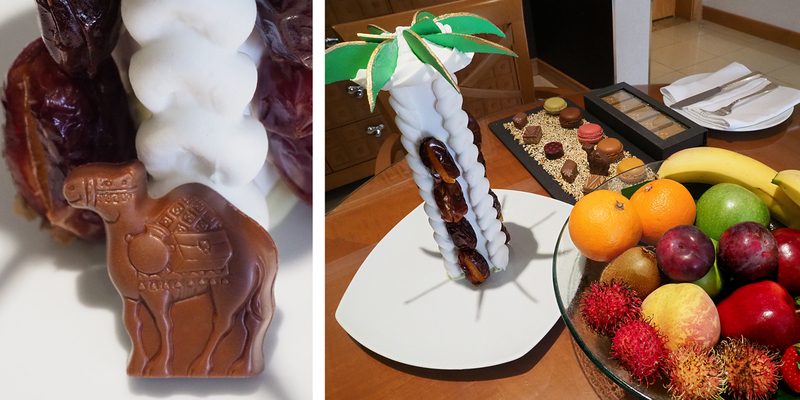 Adorable and luxurious, milk chocolate camel and palm tree made of fresh dates! 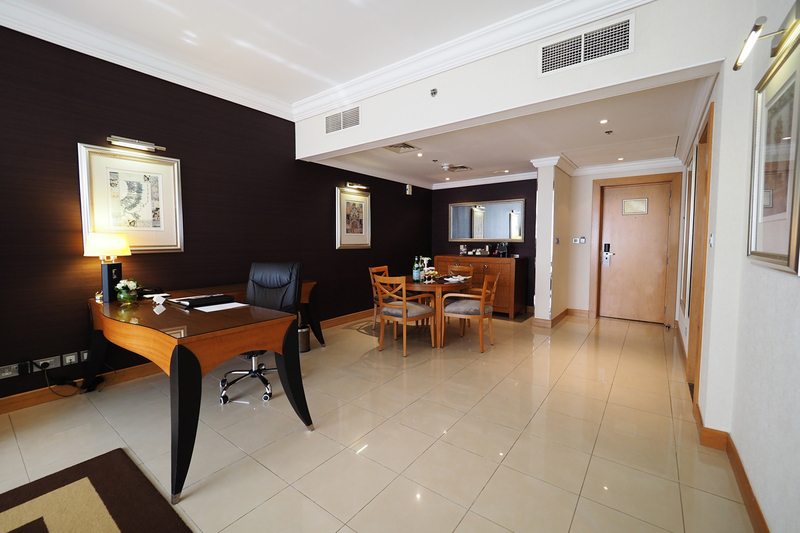 In the heart of Dubai, this 1-bedroom suite offers the perfect city break for shopping, spa, sun, and nightlife! THE EXCHANGE GRILL: If you only choose one dining experience, make it The Exchange Grill restaurant! You will not be disappointed! 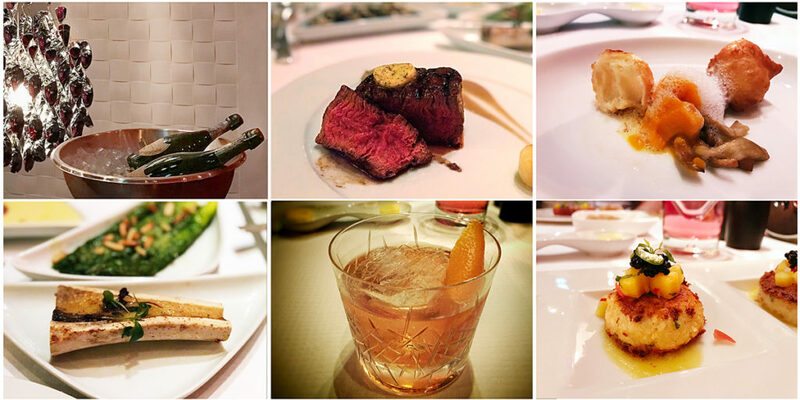 The award-winning (2016 World Luxury Restaurant Awards: Best Luxury Steakhouse Grill) Exchange Grill is the luxury meal you dream of, and it was unforgeable. Award-Winning Exchange Grill at Fairmont Dubai. Gotta love a restaurant that keeps the Dom on ice! 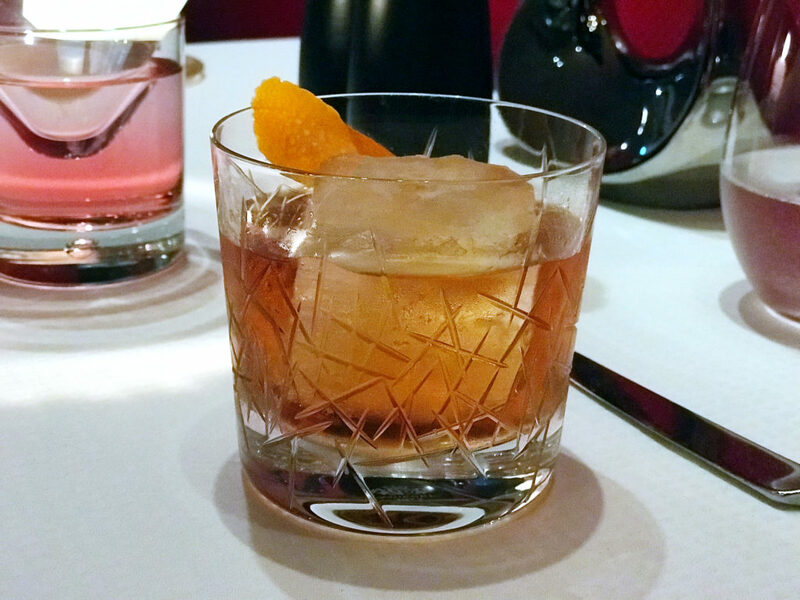 The Exchange Grill is not your average hotel restaurant. 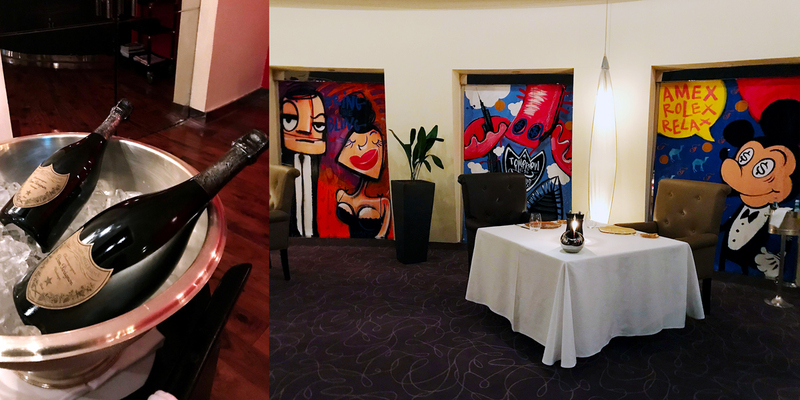 I really liked the décor, the pop artwork is bold, and makes the space come alive, yet there is an intimacy to each table. It was well occupied but not noisy like a lot of other large Dubai hotel restaurants. We were treated so personally and attentively. The food was perfectly timed, and we had space between courses to enjoy conversation and the occasional signature cocktail! I ordered the 10 oz Kobe Beef Fillet with the marbling score of 9. I like my steak rare, and the chef cooked it perfectly to my preference! The Kobe beef was absolutely top quality; the silky, melt-in-mouth tenderness, exquisite taste and juiciness was unforgettable! Even after cocktails, a generous sized amuse-bouche, and the appetizers, I did not put down my fork on that steak. The best steak I’ve ever had! 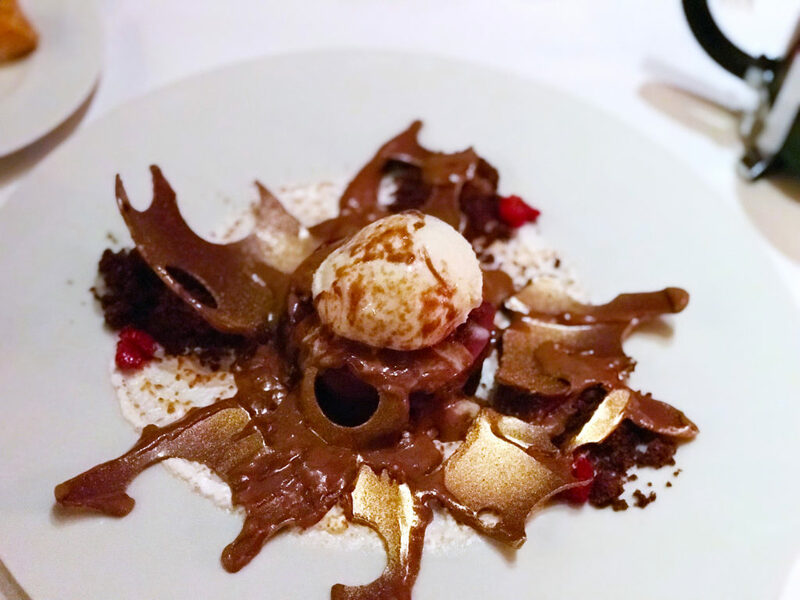 Not to be dismissed, we had a dramatic and indulgent dessert. A gorgeous milk chocolate sphere, poured over with a glaze, melts open revealing a gold leaf flower of fresh raspberries and vanilla bean mascarpone ice cream! I had to eat all of it. It’s no wonder The Exchange Grill has won prestigious award after award amongst the stiff competition of Dubai luxury restaurants! It was the best dining experience I’ve had in years! This was an expensive meal, but Dubai is not inexpensive. This is a meal you will celebrate. DOKUZ: For a more casual, informal and unique dining experience, a hidden gem is Dokuz on the 9th floor. Again, coming from a very rainy and cold 3º Vancouver winter, and sitting in the warm and dry 30º open air rooftop of Dokuz, enjoying a cold drink was pure therapy! Fairmont Dubai’s Turkish themed Dokuz is an al fresco lounge with contemporary cocktail drinks, wine, craft beers, and fresh made mocktails, with a spectacular view of the Dubai’s skyline. Dukuz is popular with shisha smokers so if you want a safe place to try this local activity, stylish, upscale Dokuz lounge is an ideal place. Hot and Cold Authentic Mezze. A great place to indulge in a glass of fine wine or champagne, nibble on an assortment of hot and cold mezze, and watch the world go by. Making the most of the sun, this hotel boasts two rooftop pools, to catch all day sunshine, one on the east side and one on the west side. When you’re not gazing at the Dubai skyline, or ‘working’ on that report via fast wi-fi, this superb al fresco oasis will relax and set you up for your next day of business. It’s a hard job, but… Poolside service includes fresh made smoothies and juices, complimentary fresh towels and cold water, a gourmet menu of healthy food options, and coffee espressos or teas to get you through the sunny afternoon. The pools both have the most beautiful painting, that catch the light and delight. Fairmont Dubai Spa (photo courtesy Fairmont Dubai). 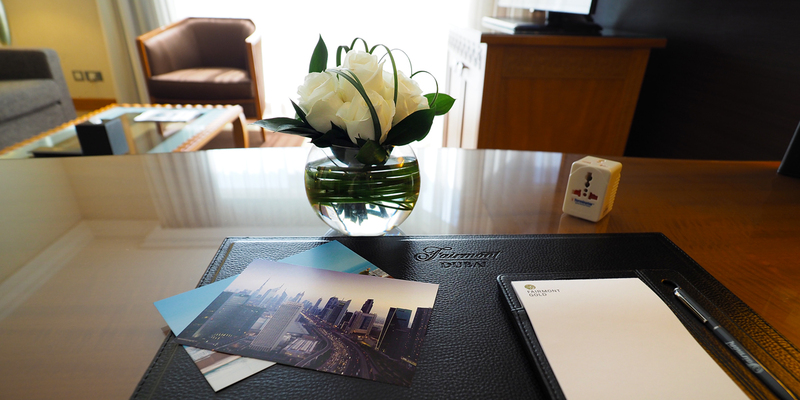 Fairmont Dubai has extensive facilities and professional staff to turn your holiday into a health retreat! Whether aerobic exercise classes, professional trainers, yoga, gym accessories, or opulent jacuzzi and sauna, steam rooms, separate women’s vs men’s areas, foot baths, hair salons for men and women, and all kinds of treatments. Fairmont Gold reception area on the 33rd floor. If you’re going to be spending time at the hotel, I highly recommend Gold Lounge access! Fairmont Gold Lounge offers a sumptuous daily Arabic and European breakfast buffet with made to order omelettes and specialty eggs, and barista-crafted espresso drinks served between 6.30 – 11am. I was really impressed with the staff in the Gold Lounge who had so much knowledge about Dubai and the history of the Sheikh Zayed Road and the hotel! Rare to find hotel staff who love their work at a hotel and still enjoy sharing that with guests!! An oasis of calm, throughout the day there are espresso drinks, tasty desserts, teas, and in the evenings between 6 – 9pm, an honour bar with complimentary cocktail canapés and house beverages. Service was absolutely exceptional throughout our stay at the Fairmont Dubai Hotel. Not cloying as other hotels I’ve stayed. Staff here seem sincere, happy, professional, and are top-notch! I loved the fantastic breakfast buffet selection in the Cascades Restaurant on the ground floor. There was a huge selection of all types of choices at the buffet including European, Indian, Chinese, Turkish and Middle Eastern, plus a la carte offered from 6.30am – 11.30am, daily. Tip: Get breakfast included in your room rate. Excellent for business travellers who need to have a good breakfast before a long work day! For the Party People: Behind the Fairmont Dubai building is the renown and swank Cavalli Club. If you want to party with the glitterati, watch the champagne flow and get a view of the opulent Dubai nightlife, spend a night at the Cavalli Club. Dress to Impress. Open from 8.30pm – 3am, daily. Oh yeah, and these VIP and very special Fairmont Dubai personalized Luxury Toiletries are coming home with me!